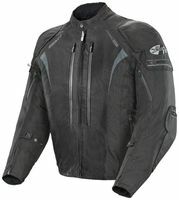 Joe Rocket offers this new “Ion” version of the Atomic series jacket. The Atomic 5.0 or this new Atomic Ion are variants of Joe Rocket’s “go to” sport textile jacket. What’s new about the Ion? This jacket has much improved nighttime visibility. The reinforcement material used over the shoulders and elbows is their “Innolite” fabric that has MANY little dots of reflective material woven in to the fabric. It looks sharp during the day, but lights up at night when car headlights shine on it. Otherwise, the Ion version shares the same protective and comfort features with the newest non-Ion jacket version, the Atomic 5.0. The shell of this jacket is waterproof… the material doesn’t allow water through and the seams are “taped” on the back side to prevent leaks. This type of construction should be about a 95% solution for most wet weather conditions. The various zippered vents are waterproof styles and there is a LARGE double closure flap in front to prevent water entrance through the main zipper. I note that the short sleeve end zippers are not waterproof, so you’ll want to wear gauntlet gloves over the sleeve ends if possible.